A protected wetland that's known as one of 'Britain's breathing spaces', The Broads National Park is a great place for a camping or glamping holiday. There’s something for everyone in this unique part of the country that combines a fascinating history, rare wildlife and scenic beauty along its waterways. The Broads National Park lives up to its reputation as a peaceful place to visit but there’s plenty to do too. It’s great for active outdoor-lovers with wild swimming, paddle-boarding, sailing, kayaking and canoeing opportunities everywhere you look. And, on land, there’s more adventure; footpaths, cycle routes and bridleways offer opportunities for exploration beyond the water’s edge. Beyond The Broads, East Anglia is also known for its beaches. Arty towns on the Suffolk Coast and the wildlife-rich, windswept sands of Norfolk are never far away when you’re camping in the national park - in fact a short stretch of coast falls within its boundaries. There are campsites near the coast, meadows with riverside pitches and glamping hideaways tucked in the trees. The Cool Camping travel experts have been out and about among it all to find the very best campsites in The Broads National Park for our hand-picked collection. The Broads and the beaches of Norfolk and Suffolk have long made it a popular holiday destination so it’s no surprise that there are plenty of places to go camping in the Broads National Park. The speciality, of course, is camping on the water’s edge. There are plenty of campsites with a stretch of stream, canal or river running through or past them. Some are quiet tents-only affairs where you can part the reeds to launch your own canoe or kayak. Some are larger sites with their own slipways and boat hire. Even campsites without direct access to the water will never be far away from it, because in the Broads, there’s water, water everywhere. It’s likely that it’s the water that’s brought you to The Broads. And in this protected landscape, unless you’re staying on it, there’s no way to get closer to it than on a camping holiday. Campsites are allowed on the river banks where other development is not so if you want to make the most of the waterways, camping is a fantastic way to stay. Camping also brings you closer to one of The Broads' other greatest treasures; it’s wildlife. Stay in a tent and you might be woken by the dawn chorus and fall asleep with the sound of a hooting owl. For holidays which make the most of the great outdoors, camping can’t be beaten. If you like the sound of camping but don’t have your own tent, there’s aways glamping. Hire a bell tent, tipi, yurt or safari tent and you’ll be able to go camping without owning the gear. 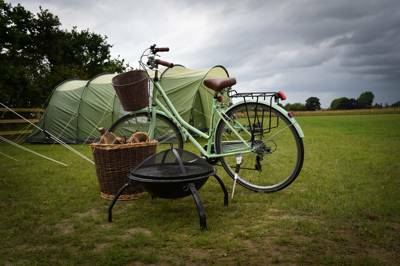 There are plenty of glamping sites in The Broads with pre-erected tents which offer a chance to test the waters. 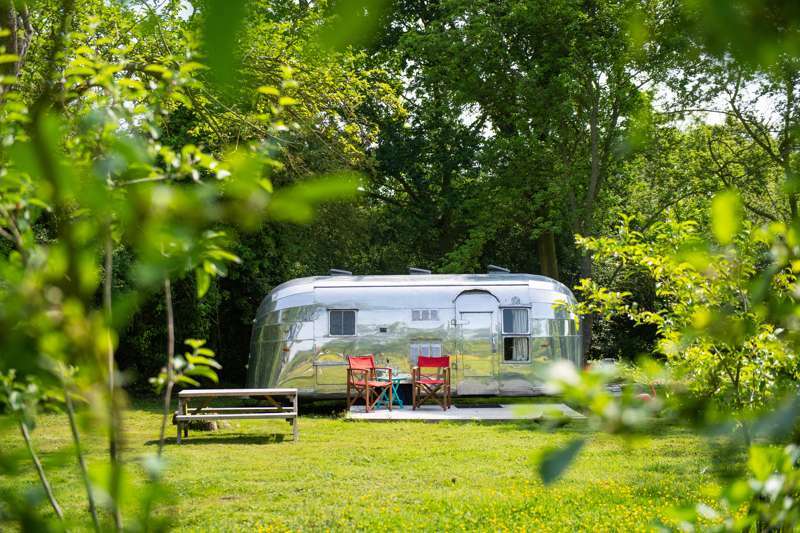 There’s glamping accommodation on shared sites where campers and glampers share facilities and there are places which are dedicated to glamping only. And if you don’t fancy sharing your facilities with anyone, choose one of the Norfolk or Suffolk glamping sites we’ve found which offer high-end luxury camping. There’s plenty of glamping accommodation with en suites and there are even places with private hot tubs. Often the more luxury glamping is offered in accommodation that’s a little sturdier than a tent. Think shepherds’ huts, gypsy caravans, vintage vans and fairytale-style treehouses. Tuck yourself up in one of these and it doesn’t matter what the weather throws at you. In the sunshine you can throw open the doors and the let the outside in while in bad weather you can batten down the hatches and get cosy. For this reason, glamping extends the camping season in to cooler weather and is as good for seasoned campers as it is for first-timers. Whether it’s top-end glamping or no-frills tent pitching, camping is a great option for a family holiday – and The Broads offers an incredible location for it. If you’re a family of water babies, simply messing about in boats can fill all day, every day of your holiday. You can hire canoes, go for a cruise or learn to sail while you’re in this natural water wonderland. Kids might also like to look out for wildlife, give fishing a go and cycle on the towpaths along the river. East Anglia’s flat terrain makes family-friendly cycling easy to find. There are plenty of family-friendly attractions in Norfolk and Suffolk too from beach resorts with fun fairs to the magical woodland adventure theme park Bewilderwood. The Broads National Park is undoubtedly a great family-friendly location, but the appeal of a family camping holiday here also lies with the camping itself. You could probably stay on site for the duration of the holiday and find that your kids would be happy. Aside from the fact that your Broads campsite will probably have a spectacular setting, it offers the chance to make friends, play outside all day, stay up late and eat marshmallows. Added to this is The Broads’ appeal of swimming or boating and the adventure of sleeping in a tent. If a kid could design a holiday, we think it would probably look something like camping in The Broads. Peaceful paddling along the waterways, long days sailing on the lake, epic walks in incredible scenery… camping in The Broads is just as much fun for grown-ups. You can kayak or fly kites, birdwatch or bike… an adults-only holiday in The Broads gives you plenty of opportunity to indulge in your hobbies – or try out new ones. And whether you’re going alone, looking for a romantic break or after a place to holiday with friends, The Broads National Park has plenty to do and some fabulous places to stay. The Cool Camping collection features some camping and glamping sites that are reserved exclusively for grown-up getaways. Often these are the really high-end glamping sites with accommodation that’s impossibly romantic and aimed at relaxation. There are cosy cabins that are just right for a couple or secluded shepherd’s huts where you won’t be disturbed. You don’t need an adults-only camping or glamping site to have a good time as a grown up though. 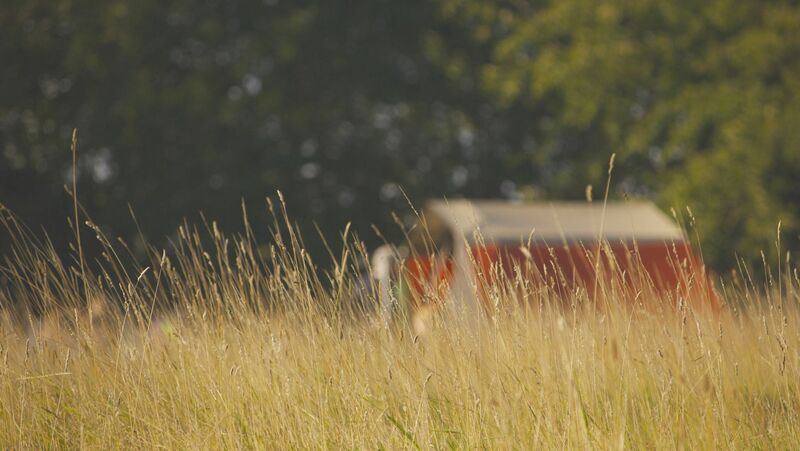 We choose sites that tend to have spacious pitches so you shouldn’t find yourself disturbed (or disturbing) your neighbours – even if you’re staying up late to chat round the campfire and they’re getting up early with the kids. But if it’s quiet camping you’re after for your adults-only trip, how about taking it in term time or even midweek? The Broads are wide expanses of water which help connect the seven rivers that flow through this part of East Anglia. They were originally pits left in the landscape as a result of people in the Middle Ages digging out peat for fuel. It was way back in the 14th century that these peat pits flooded and formed the watery network that we know as The Broads National Park today. People have been heading to The Broads for holidays since the 19th century but it took until 1989 for it to become a protected landscape. Although called a national park it has a unique status which protects the navigation channels in addition to its landscape, wildlife and cultural heritage. The Wentsum, Yare and Bure are three of seven rivers that together with 60 broads and countless tributaries and streams make up the network of waterways through the low-lying land of the national park. It’s Britain’s largest protected wetland with marshes and fenland included too. There are nine nature reserves among the 120 square miles that make up the park and it’s home to a quarter of Britain’s rarest species. In the humble opinion of the Cool Camping team, the best bits of The Broads are inevitably its many campsites! Peaceful places on the riverbanks where you can watch rare butterflies flutter by and enjoy a campfire after a hard day’s paddling along waterways. But if you’re wondering which area of The Broads is best as a base, the answer will depend on what you hope you to do while you’re there. You can’t really go wrong if you’re hoping to do a bit of wildlife watching but Hickling Broad is a particular hotspot. 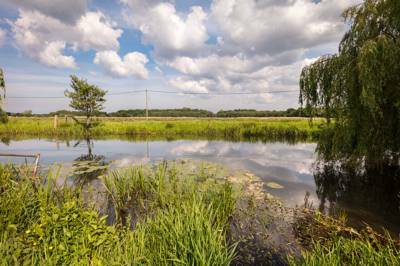 The largest of the broads, it is also a nature reserve managed by the Norfolk Wildlife Trust who operate boat trips to hidden corners of the waterway in summer. It’s a haven for cranes, bitterns and Marsh harriers and you can also see the rare swallowtail butterfly here, the biggest species found in Britain. Choose a campsite near Hickling Broad and you will also be within reach of Horsey Beach, part of the short stretch of coast that falls within the national park and a breeding ground for seals. If your camping trip in The Broads National Park is more about watersports and sailing, you might prefer to be near Whitlingham Broad. On the furthest inland finger of the national park, Whitlingham has a country park and an outdoor education centre with all sorts of water-based activities on offer and paddleboards, kayaks and more for hire. Whitlingham is within easy reach of Norwich too so camping near here is great if you want to explore the city sights as well as the waterways. The southern gateway to the national park is Oulton Broad, just a mile inland from the Suffolk seaside town of Lowestoft. It’s got plenty of amenities and attractions nearby and there’s always lots going on. The ‘capital’ of The Broads on the Norfolk side is Wroxham on the River Bure. This bustling village is the perfect place to pick up information, supplies and watch the world sailing by. 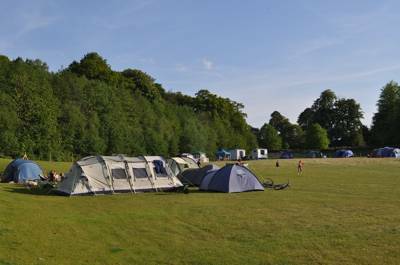 Camping near here puts you close to family-friendly attractions including Bewilderwood. But that’s not to say the area’s not peaceful. Like the rest of The Broads, the waterways here remain tranquil and a haven for nature especially at Norfolk Wildlife Trust’s Bure Valley marshes nature reserve. Norfolk, and Suffolk, are awash with great places to visit and as The Broads sit on the border between the two counties, a camping holiday here puts you at the heart of the East Anglian action. Head inland for Norwich, the only city within a national park, to see its 900-year-old cathedral and wander its narrow streets. Head south in to Suffolk to visit well-heeled Aldeburgh or Southwold with its quirky pier. Or head north for the long sandy beaches on the North Norfolk Area of Outstanding Natural Beauty and a taste of Cromer crab. Within reach of London, but as rural as landscapes come, East Anglia is a county of picturesque villages and historic market towns punctuated with grand houses. Many of them are great places to explore, none more so than the royal residence at Sandringham on the north Norfolk coast. Deeper inland, you can discover the trees of Thetford Forest and, in the Sussex countryside, Dedham Vale - the place that inspired many of Constable's paintings. For more inspiration on things to do in The Broads and East Anglia take a look at the Visit East Anglia website. Campsites in the Broads norfolk broads suffolk broads at Campsites in the Broads National Park, Looking for waterside campsites? Discover the best campsites in the Broads National Park in Norfolk and Suffolk with this hand-picked collection of the very best campsites, all chosen by the expert authors behind the best-selling Cool Camping guidebooks.